Durga Yadav (left) comes from a village in Rajasthan. She never had a passport. She had only seen airplanes flying over her village. 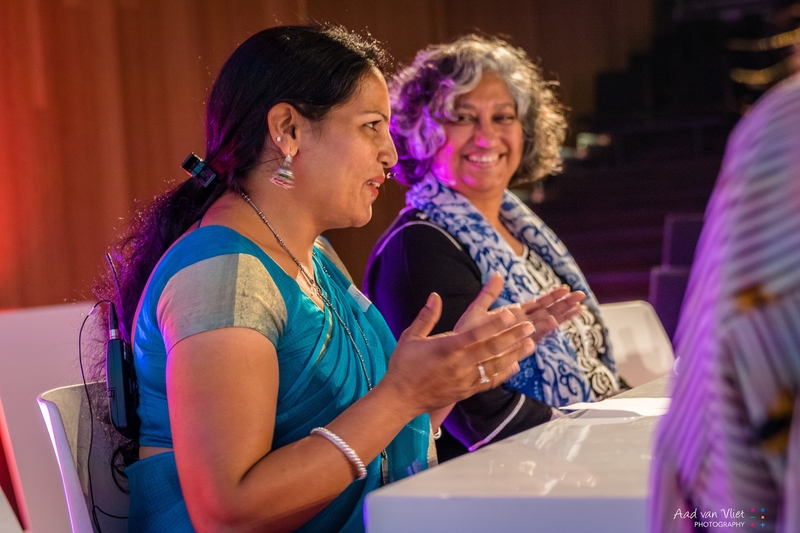 But on September 25, 2017, Durga won the hearts in the audience of Women on Wings’ 10th anniversary event in the Netherlands. At the celebration event Durga shared how a job and income not only enabled her to send her children to school, but also to build a new house. Before, Durga and her family lived in a small 2 room house. The new house has three stories. Durga’s daughter Anjali studies to become a doctor and will only consider marriage when she can financially support herself. Next to her job with Sadhna, Women on Wings first business partner in India, Durga started her own jewellery enterprise last year. Her dream is that her company grows and that she can employ more women from her village. Durga’s life is a typical story of her being married off young and becoming a mother at a tender age of 16. But Durga wanted a different future for her kids so she started working. Durga is the living proof that a job and an income give women the opportunity to give their children an education. Working is empowering and builds self-confidence. It gives women a voice in the village and the ability to become a role model for their daughters. This trip of Durga’s has not only inspired her children to achieve greater heights but also the other women in her village. ← WIN – WIN, Too little and Too much…..